Engrish of the Week: Like a virgin? 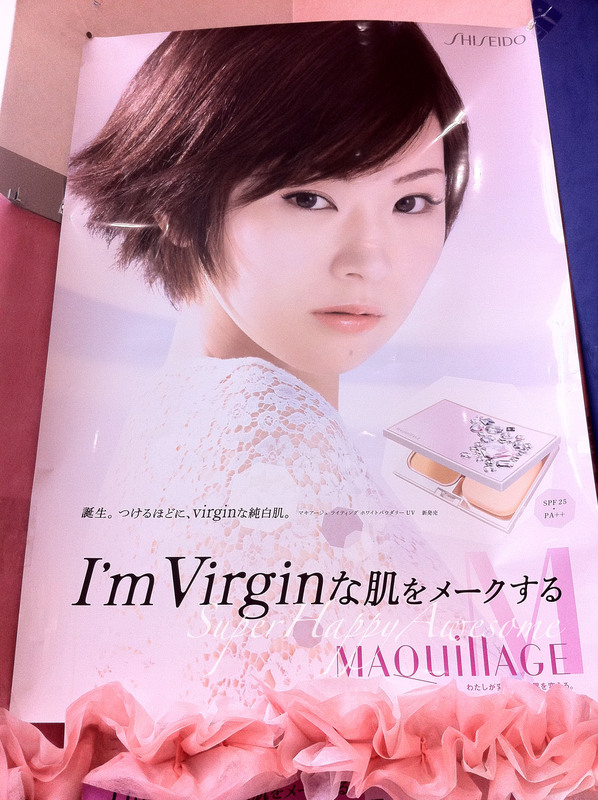 Shiseido’s Maquillage makeup line’s tagline is “I’m Virgin” because everyone loves a vir…wait, what? These words, they do not mean what I think you think they mean, Shiseido! I guess they’re trying to imply that she’s young and her skin is fresh and um, untouched, but…yeah, I don’t even. File this one under “slightly creepy”! The commercial is even creepier, does anyone have a link to it online? What are your plans this weekend? We’re hoping to take a nice bike ride by the river, and hopefully enjoy some sunshine. Spring is so close, I can almost taste it! This entry was posted in Engrish and tagged ad, beautiful, cm, commercial, engrish, Japanese, makeup, maquillage, pretty, shiseido, virgin, woman. Bookmark the permalink. 8 Responses to Engrish of the Week: Like a virgin? HAHAHAHAHAHA. I saw these and just. yeah. Weekend plans… YAKINIKU PARTY! and then an eye doctor appointment. Boo. Have a good bike ride! Woo, Yakiniku! Have fun breaking in the new grill! Please let us know how goes, cause I might need to snag one of those myself. There’s definitely not enough yakiniku in my life! 10 pts to whoever gets the quote. I’m not going to argue that this makes it any better, but ‘I’m virgin’ is just part of a mangled bilingual slogan, ‘I’m virginな肌をメークする’, where ‘virgin’ is an adjective attached to ‘肌’ or skin. The whole thing means something like she makes up to look like her skin is fresh and untouched.